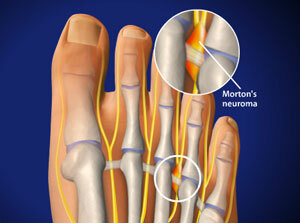 Is surgery always needed for a Mortons neuroma? There are many conservative treatments that are successful to treat a Morton's Neuroma. We reserve surgery to be a last resort for when conservative treatment does not relieve the pain associated with the neuroma. In my years as a Houston podiatrist I can estimate that approximately 30% of my patients with a neuroma do end up with surgery. Conservative treatment includes anti-inflammatory medication, cortisone injections, sclerosing alcohol injections and custom orthotics. When surgery is indicated, it is usually performed with great success. The reason for this is that the neuroma itself is surgically removed. Since the inflamed section of nerve is removed, the associated pain resolves quickly thereafter. If you have suffered with pain from a Morton's neuroma, but have been nervous to come into our Houston podiatry office because of a fear of surgery, you can relax. In most cases we don't consider surgery as an option until we pursue non-surgical treatment first. Contact Tanglewood Foot Specialists to schedule an apointment with Dr. Andrew Schneider.